1U rack mount server will provide your business with a solid platform while maintaining very low costs. 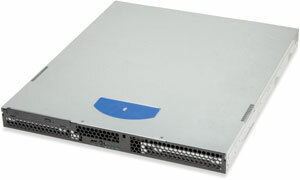 The ProServ 750 optimized 1U Rack Server chassis has a very small chassis foot-print of 20 inches deep. The cost-efficient ProServ 750 1U Rack Server makes life easy for deployment of front-end Web and Mail Server and Security Servers, as a proxy server and, for general server computing requirements. The ProServ 750 1U Rack Server arrives ready to conduct business eliminating lengthy downtime for setup and troubleshooting. This 1U Server is an excellent candidate for Web Hosting and Mail Hosting Services. Servaris ProServ 750 supports FreeBSD, Open Solaris, Fedora Core, Red Hat, SuSE, Microsoft Windows 2003 and 2008 Server. Memory: Up to 32GB DDR3/1333MHz PC3 Registered E.C.C. CMTL Certified Memory. Cooling System: Two 120mm and Two 92mm Hot-Pluggable Cooling Fans. Fan speeds controlled by Integrated System Management Controller. Graphics: Integrated ATI Rage with 8MB video memory.